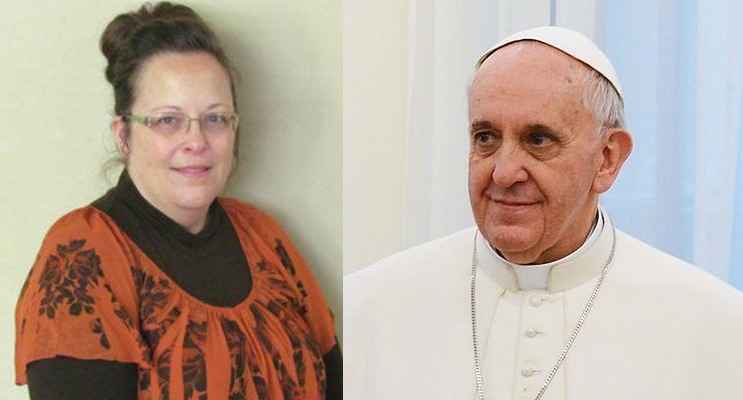 WASHINGTON — The embattled Kentucky county clerk Kim Davis, who identifies as an Apostolic Pentecostal, met privately on Thursday with Jorge Bergoglio, also known as “Pope Francis,” who is the head of the Roman Catholic religion, during his visit to the United States. Davis said that she asked a Catholic “monsignor” if it would be okay to hug the pontiff, and was told that the greeting would be permissible. Davis advised that she plans on giving the rosaries to her parents, who are both Roman Catholic. “[H]e said to me, ‘Please pray for me.’ And I said to him, ‘Please pray for me also, Holy Father.’ And he assured me that he would pray for me,” she recalled. The Kentucky clerk also released a statement on Tuesday about the meeting through her attorneys at Liberty Counsel, which is an arm of Liberty University. The legal group is led by Matt Staver, a former Seventh-Day Adventist minister. As previously reported, Davis has been in headlines in recent weeks for refusing to issue marriage licenses to homosexuals. She spent six days behind bars earlier this month when she would not comply with a judge’s order to do so because of her religious beliefs. Davis is currently still under scrutiny after removing her name and title from the licenses being issued by Deputy Clerk Brian Mason as the ACLU is seeking to have her punished for allegedly violating a court order not to interfere with the issuance of the documents. She has stated that from the beginning she only wished to have her name removed from the licenses as she is not seeking to stop “gay marriage” in Kentucky.